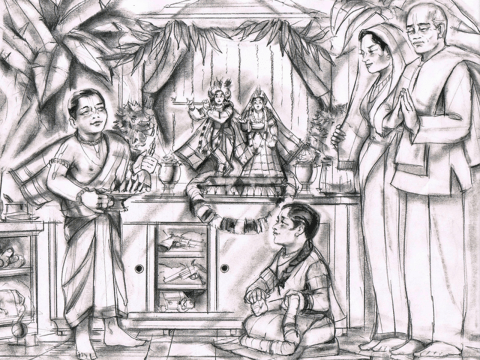 When Abhay was about six years old, he asked his father for a Deity of his own to worship. Gour Mohan De purchased a pair of little Radha Krishna Deities for Abhay. 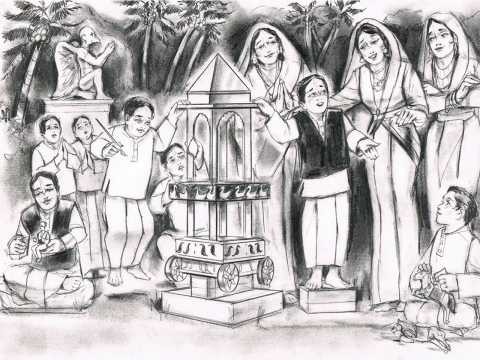 From then on, whatever Abhay ate he would first offer to Radha and Krishna, and imitating his father and the priests of Radha Govinda, he would offer his Deities ghee lamp and put Them to rest at night. 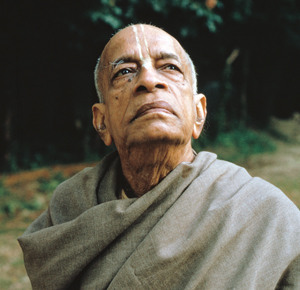 Srila Prabhupada : By the grace of the Lord, there are still families that foster transcendentalists generation after generation. It is certainly very fortunate to take birth in such families. Fortunately, both our spiritual master, Om Vishnupada Sri Srimad Bhaktisiddhanta Sarasvati Gosvami Maharaja, and our humble self, had the opportunity to take birth in such families, by the grace of the Lord, and both of us were trained in the devotional service of the Lord from the very beginning of our lives. 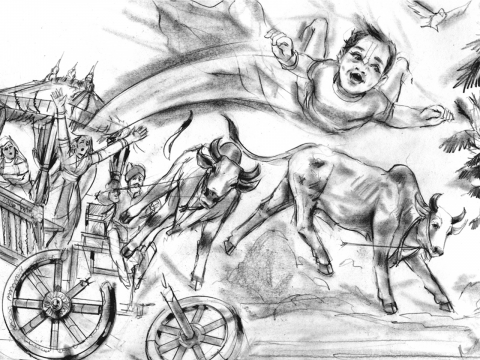 Srila Prabhupada once recalled with great clarity, an accident that occurred when he was very young, and his family was travelling in a bullock cart. After all those decades, he still distinctly remembered flying through the air when the wheels hit a stone and collapsed. Baby Abhay was the only one unhurt, landing on soft grass. 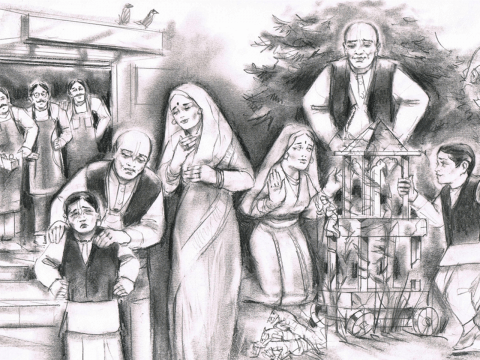 Srila Prabhupada clearly remembered that when he was four, the year that the plague hit Kolkatta, His father would invite sankirtana chanters from the street into his house. 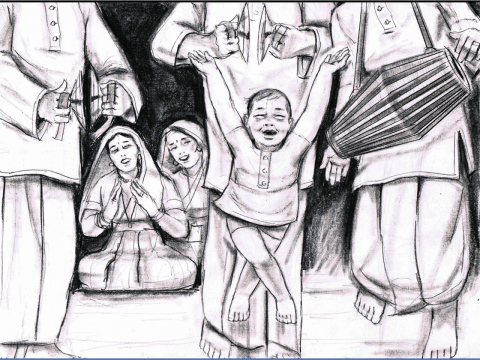 Although reaching only up to their knees, little Abhay would join the chanters in singing and dancing. Shortly after this, the plague subsided. 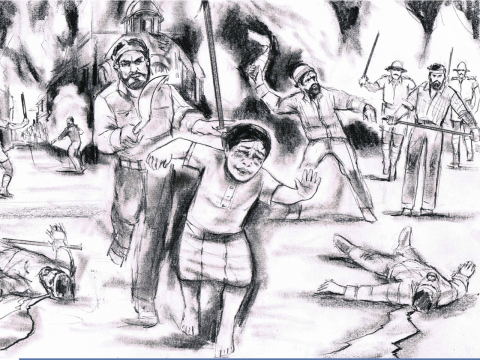 During the communal riots in Calcutta when Abhay was about thirteen, he had to cross a riot torn area in the neighborhood to get home. A Mohammedan wielding a knife almost attacked the boy to kill him but he managed to run fast enough to get away and reach home. 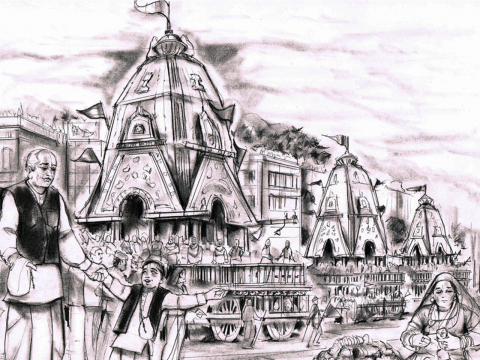 The annual Ratha-yatra held by the Mullik family for Lord Jagannatha was always a fascinating occasion for Abhay. Three separate carts for Jagannatha, Baladeva and Subhadra would roll from the Radha Govinda temple, down Harrison Road and then return. Plenty of prasadam was distributed to the public on this day. Abhay was very keen to conduct a Ratha-yatra of his own in the neighborhood. His father agreed but the only cart they found was in disrepair, donated by an old lady. Abhay was disappointed but his father got the cart fixed and freshly painted. Abhay got his friends and their mothers to help organize various aspects of the Ratha-yatra. The children helped with decorating the cart and the mothers cooked treats to be distributed at the festival. Abhay’s Jagannatha Ratha-yatra lasted for eight consecutive days and everyone in the neighborhood joined in the celebration, chanting, playing drums and karatalas and pulling the cart. 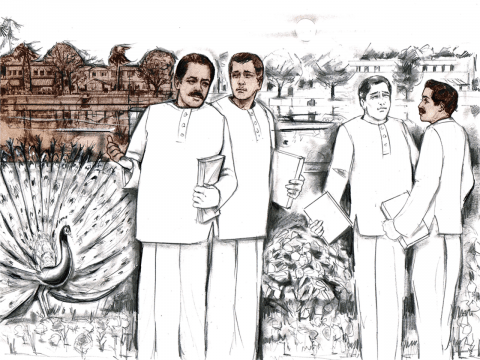 When Abhay was a third-year college student, his father, Gour Mohan De, chose a girl from a family associated with the Mulliks, to marry Abhay. Although Abhay didn’t appreciate his father’s choice of a wife and had thought of marrying another girl, in deference to his father, he put his reluctance aside. Abhay was now twenty four years old; he was a nationalist and manager of a big chemical factory. Abhay’s friend Naren insisted they go and meet Bhaktisiddhantha Swami, a great Vaishnava leader from Mayapur who was visiting Kolkatta. Abhay was skeptical about sadhus as he had seen many in his childhood, hosted by his father. He did not consider everyone wearing saffron robes to be saintly. Naren persisted, and finally Abhay relented. 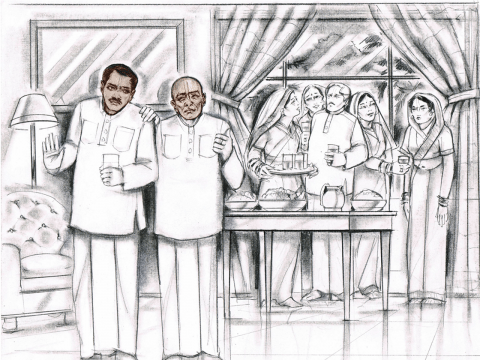 Abhay and Naren offered their prostrate obeisance to Bhaktisiddhanta Sarasvati when they saw him seated on the terrace. But even as they rose and prepared to sit, the Swami said to them, "You are educated young men. 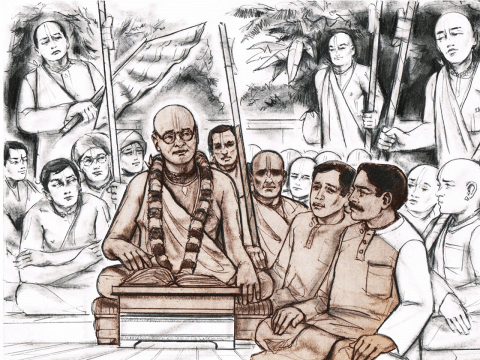 Why don’t you preach Lord Chaitanya Mahaprabhu’s message throughout the whole world?” Abhay was taken aback. This person had already told them to become preachers and travel the world!